Jumpin' Jacks Toys features a hand picked selection of construction kits for kids of all ages. These quality products allow children to design and build various shapes as well as toys such as racing cars, motorcycles and dune buggies. These popular construction kits will occupy kids for hours, teaching them the basic, yet important principles of physics, motion and mechanics. Using quality made materials, our construction kits for toys are a brilliant gift idea for your kids or somebody else's. SmartMax Click and Roll is a magnetic construction set that enables kids to create amazing structur..
Add flowers to your SmartMax creations! SmartMax Flower Fun includes 5 pieces... one medium ba.. 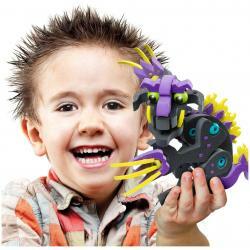 Build the ultimate ball track with this new SmartMax magnetic construction set, with endless option.. Magnetic Discovery - from a very young age! With this SmartMax set you can build 2 cool cars that ..